Proverbs 3:7-8 "Be not wise in thine own eyes: fear the LORD, and depart from evil. It shall be health to thy navel, and marrow to thy bones." In this third chapter of Proverbs, verses seven and eight are typically overshadowed by verses five and six. It is unfortunate when these four verses are broken up because they belong together and are so closely linked. In fact, verses seven and eight are best understood when keeping them connected to their sister verses in the text. Early in this chapter, Solomon is emphasizing the physical benefits of following his father’s instruction. As has been mentioned, this principle had its foundation in the Fifth Commandment of the Jewish Law. As a part of following his father’s instruction, Rehoboam would have the opportunity to reap the benefits of truth - something he shouldn’t take for granted given the deceitfulness of the human heart beating in a world of deception. If he cherished truth along with mercy, Solomon’s son was told that he would ultimately enjoy the favor of God’s eye. With this context in mind, the counsel of verses seven and eight obviously compliment the passage. Solomon warned his son not to see himself in a skewed manner – not to look on himself in an inflated fashion. Instead, he was instructed to FEAR GOD. It would be the fear of God that then would bring “health to his navel, and marrow to his bones.” Solomon didn’t want his son to “let truth forsake him” –which included the truth about himself (verse 3). He didn’t want his son to become more interested in how he saw himself – he wanted his son to see himself “in the sight of God” (verse 4). This father knew the dangers of becoming self-sufficient and ultimately, self-righteous. He knew the benefits of fearing God, benefits that self-righteousness would take away. The benefits of fearing God were the same physical benefits of honoring father and mother. Verse seven exposes the sin of thinking too highly of ourselves. When comparing the first and second halves of the verse, being “wise in our own eyes” is considered “evil.” It is the sin God hates the most – pride. Ultimately, this is the sin that Solomon was worried about for his son. By receiving all of the instruction, counsel and wisdom at a young age, Rehoboam would be set up for success by becoming incredibly responsible. But by receiving such a wealth of wisdom at a young age, he would also be vulnerable to failure by becoming incredibly self-sufficient. Trained to be wise, Rehoboam could become wise and as a result, succeed in life. However, the danger of learning wisdom at a young age is the danger of becoming “wise in your own eyes.” The consequence of this evil is becoming wicked in God’s eyes. In this passage, Solomon is trying to give his son the tools necessary to earn favor in God’s sight (verse 3). In fact, the key to earning favor in the sight of God is to always maintain a consciousness of the sight of God. The antidote for the poison of pride is the fear of God. Living in the fear of God is living with a constant consciousness of God’s presence. It is maintaining a constant awareness of God and a reverence for God. Living in the fear of God is constantly seeing yourself through the eyes of God. Having a fear of God is having an awareness of and a respect for the way God sees us. This forces us to see ourselves differently than we would naturally see ourselves. Because the human heart is so deceitful (Jeremiah 17:9), we typically see ourselves more highly than we ought to think. We tend to see ourselves smarter, thinner, younger, kinder, healthier, holier and wiser than we are. By seeing ourselves as God sees us, we will be encouraged to have a more realistic view – a more TRUTHFUL perspective of ourselves. Living without the fear of God allows what you see in the mirror or in the mind to determine who you think you are. This is dangerous because man has a hard time seeing the truth of the matter where God “looketh on the heart” (1 Sam. 16:7). 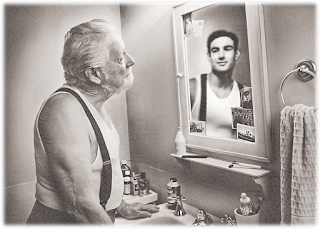 See yourself as God sees you – not as others see you and certainly not as you see yourself. This is done by living in the fear of God. Choosing to live in the fear of God is choosing to live with a constant awareness of the sight of God. Choosing to live in the fear of God is choosing to use the mirror only for matters of hygiene and not for matters of holiness. Remember, the mirror on the wall can’t see beyond the skin. It’s sufficient for assessing the face but only God is sufficient for assessing the heart. Make the sight of God your gage for personal assessment and you’ll be far more likely to earn favor in the sight of God. If you don’t value the sight of God for personal assessment, then you’ll think of yourself more highly than you ought to think and as a result, earn anger in the sight of God. While verse seven exposes the sin of thinking too highly of ourselves, verse eight highlights the benefit of thinking highly of God. Take note that Solomon didn’t suggest that the fear of God would benefit his son “AS health to thy navel” or “AS marrow to thy bones.” No, this inspired man of God promised his son that the fear of God would be “health to thy navel and marrow to thy bones.” This isn’t an illustration or a metaphor. This verse isn’t comparing a spiritual benefit to a physical benefit. Solomon isn’t using medical terms to convince his son how powerful the fear of God is to his son’s soul. Inspired by the Holy Ghost, Solomon is attaching physical benefit to choosing a spiritual discipline. Don’t misunderstand the Bible – it is not suggesting the fear of God is the cure for cancer or the fountain of youth. That being said, don’t misread the Bible either – it is suggesting that the fear of God offers physical benefit. After all, why wouldn’t living with a constant consciousness of the Creator bring you some level of tangible blessing from Him? As the visible source of life, the navel of the God-fearing person is promised health. As the invisible source of life, the marrow of the God-fearing person is promised blessing. Much more can be said about the topic of health and physical prosperity but don’t disregard the Biblical connection between holiness and healthiness. We’re living in a day and age where society is obsessed with the condition of the body and unfortunately, this comes at the expense of the condition of the soul. Don’t let the MIRROR ON THE WALL have more influence in your life than the EYE OF GOD.